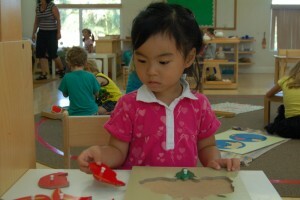 The Montessori classroom often seems surprisingly quiet compared to the nursery school. That is because of the highly organized program and environment that the teacher prepares. The teacher carefully guides the child towards self-discipline by exposing him to both physical and mental order. In the classroom, children are free to move about, to talk to their peers, and work with any material already introduced to them by the teacher. They are encouraged to explore and to satisfy their natural curiosity. 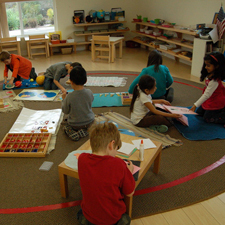 A Montessori class is typically composed of students with a three-year span. Ideally, the child will stay in the class for the entire cycle, hence forging a stable community and meaningful bonds. 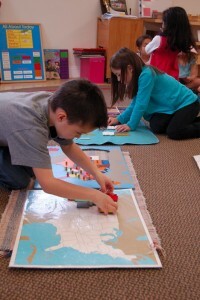 In this multi-age Montessori classroom, you will see students of different ages working together. Older students enjoy mentoring their younger classmates, as the latter look up to their big “brothers” and “sisters”, and get a preview of the appealing work to come. All children have “absorbent minds.” All children “absorb” information and skills that are displayed to them in their environment. An example is the language that children unconsciously learn. We do not teach a child to talk or walk, rather they observe the movements and sounds, and then they “teach” themselves! All children pass through several stages of development. Birth to six – the most important years in a child’s development. The Montessori teacher, along with the child and the environment, can be seen as a learning triangle. The teacher may guide the students to new lessons and challenges, but ultimately, it is children’s interaction with what the environment has to offer that enables learning to take place. In a Montessori environment, the teacher isn’t meant as the focus of attention, so it can often be difficult to spot her. You’ll find her sitting on the floor at a table, observing the students as they work, taking down notes about their progress, or even presenting a lesson to a child or a small group of students. 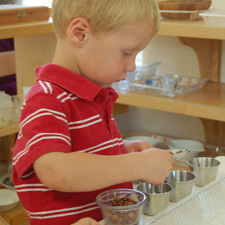 The practical life exercises are the first contact the child has with the Montessori environment. Practical life enhances motor control through coordination of both the large and small muscles and also hand-eye coordination. Children develop a sense of dignity and independence and get prepared for later skills, such as writing. Practical Life sets a strong foundation for a life as an independent and satisfied individual. 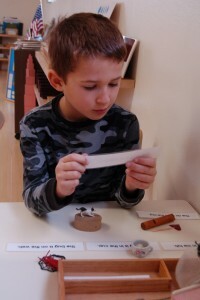 Language is an ongoing acquisition in a Montessori preschool classroom. Reading begins early by tracing sandpaper letters and learning the phonetic sound of these letters. 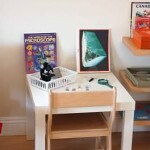 Children can handle objects that begin with these sounds. 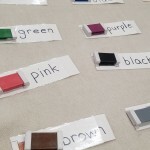 Once this has been mastered a child can begin to build words with the moveable alphabet. Story writing and creative expressions are encouraged. Spelling is not corrected in the beginning of these activities. It is more important that the idea be expressed. Later, corrections can be made when children has experienced success. All children love to touch things and explore their environment. Montessori noted this and recognized the need for something more than just the education of the intellect in the preschool classroom. Montessori strove to refine or build up their powers by educating the senses themselves. The stimuli are first perceived by the senses, which activate the nerves, which send the impression to the brain. The intellect, through the senses, creates abstract ideas. 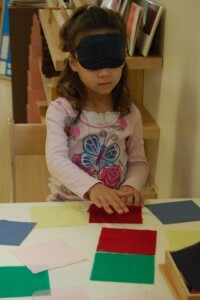 Montessori sought to train or exercise the senses through the use of specially designed sensorial equipment. Hence, it is the material that does the teaching through the child’s manipulation of it. The materials appeal to the children when presented, but are also designed to function as a basis for the future in a more refined and ordered way. The child is provided with an opportunity to repeat these exercises as often as he wishes for repetition is what builds and exercises the senses. The journey of mathematics starts with concrete materials that lead to abstract understandings. 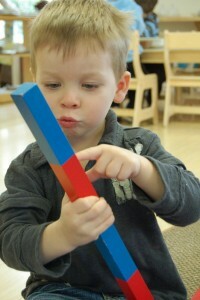 Montessori Math materials provide many opportunities to experience numbers as quantity and measurement. When children have mastered the concepts of 1-0, the decimal system can be introduced concretely by use of the golden bead material. Beautiful, hand-made glass beads represent units, tens, hundreds, and thousands. Children can construct 4-digit numbers using these materials in the Bank Game. They build quantities and match the symbols (numerals) to them. Although the child is not expected to be proficient in 4-digit numbers at this stage, he gets a foundation for future learning. Anything experienced concretely at this stage will stay with the child. When children are in third or fourth grade and these concepts are presented in an abstract way, this early contact will be recollected and lead to mastery. Montessori presents the world to children. We start with the Solar System, then the globe of land and water. Then each land and water area is explored. Puzzle maps of each continent are available. Children love puzzles. As they work with them, the names of the continents are used, later the names of the countries are also introduced. It depends on the interest of the child. Folders of pictures representative of life in each continent are available. We live in a global society. All children should be exposed at an early age to all races and ethic cultures. This promotes empathy, understanding and peace. The science material begins with the natural world around us. Animals, birds, insects, reptiles and amphibians are compared and contrasted. Children look at different biomes of the world. Parts of plants, leaves and flowers are presented in puzzle form. Real specimens are taken apart and studied. The world of nature fascinates children. We teach respect for and care of all living things. 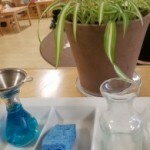 Other science experiments and experiences are introduced. Magnets, light, color, physical properties are explored with hands-on open ended activities.